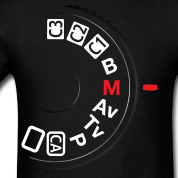 Why put your camera in Manual mode? If you have already invested in a DSLR camera, you will want to learn to shoot in Manual mode, just to protect your investment. Unfortunately, they tricked us. Computers are smart, but not where we would expect it. They can not drive a car, they can not speak, they can not play football and they can not take pictures. Will you switch your car to “AUTO” mode? Can you imagine a robot that plays football with people? What do you think about artificial intelligence, when talking on the phone with a robot? Divide this level by 100 and you will get the quality of photography in a camera “AUTO” mode. This chip, which controls your camera in AUTO, doesn’t even know what you are shooting. “What is the subject? Where is it in the frame? Let me guess for you, my master”. And it decides that you are an astronomer and you are shooting a new star, called Sun. The reason why so many people shoot in AUTO is simple: they just lack certain skills to start experimenting. You simply need to develop them. You will be amazed how many options you will have as soon as you understand the main three things : shutter speed, aperture, and ISO. This is a must for the beginner, whether you want to become a pro, or just shoot for fun. Other good news, is that you do not even need to understand all the technical details . I am not kidding. You need to have an idea how shutter speed, aperture, and ISO influence on your picture. But you need to feel their mutual relationships. This is not so difficult as it sounds. Scientists say that the main difference between humans and monkeys is the amount of objects which the brain can handle at the same time. Monkeys can hardly handle three things, but humans can handle seven. Let’s count once again: shutter speed, aperture, and ISO. Three in total, and you are definitely a human if you read this (unless you are a robot, but if you are, you anyway will not be able to take pictures). As a photography teacher, I can assure you, that these skills are not more difficult than driving a car. How to learn these basic skills? Invest whatever you have, but get yourself to this level. If you have time, read and learn. If you are ready to spend money, find a photography course or a private tutor. Or simply find somebody who will show you how to deal with these three basic things. It’s like riding a bike. You need a little help in the beginning. If you happened to be in Montreal, you are welcome join my Photography course for beginners, which is designed specifically to address this issue. Photography workshop "The girl with a saxophone"